When journalist Ann Mah’s diplomat husband is given a three-year assignment in Paris, Ann is overjoyed. A lifelong foodie and Francophile, she immediately begins plotting gastronomic adventures à deux. Then her husband is called away to Iraq on a year-long post—alone. Suddenly, Ann’s vision of a romantic sojourn in the City of Light is turned upside down. I normally listen to audiobooks which are mysteries or thrillers, but every once in a while, I enjoy a good memoir. MASTERING THE ART OF FRENCH EATING: LESSONS IN FOOD AND LOVE FROM A YEAR IN PARIS by Ann Mah isn't a traditional memoir in that it tells the author's life story. Rather this book is part travelogue, part cookbook, part history book, and part coming-of-age story. It's not something I'd normally pick up, but I'm sure glad I did. MASTERING THE ART OF FRENCH EATING is Ms. Mah's story about a year she lived in Paris. When her diplomat husband was assigned to Paris, Ms. Mah was absolutely thrilled. She pictured them discovering the sights and sounds of France... together. However, he was immediately transferred to Iraq and she found herself all alone in Paris. It wasn't exactly what she had in mind! As a way to deal with her disappointment (and loneliness), her husband suggested that she start traveling a little and trying out some of the foods for which France is known. Ms. Mah begins a year-long quest to sample and learn the history behind many traditional French foods including Boeuf Bourguignon, crepes, and andouillette sausage (YUCK!) In the process, she also learns some very important things about love, marriage, friendship, and herself. I thought MASTERING THE ART OF FRENCH EATING was delightful albeit it probably wasn't the best book to listen to while working out! I loved "discovering" France along with the author, and she did a fabulous job of bringing the country and it's food to life. In addition, I enjoyed the parts where Ms. Mah discussed her personal life and the struggles she was experiencing. I guess I'd say that I appreciated the balance between memoir, food, and history! Each chapter was about a different traditional French food. Ms. Mah not only went into detail about describing the food but she also provided a recipe at the end of each chapter for those readers daring enough to try them! In addition, she provided a great deal of background about the region where the food was initially created and the history of the recipe. I found it all to be very interesting, but I'm still reeling from the sausage chapter! 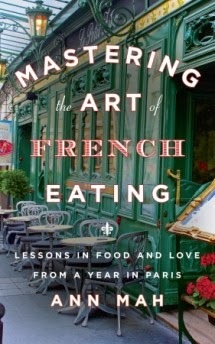 The audio of MASTERING THE ART OF FRENCH EATING was read by Mozhan Marno, and I thought she did a fabulous job. She had no problems going back and forth between English and French phrases and her voice was just pleasant -- if that makes sense. I wouldn't hesitate to pick up another audiobook read by her. Overall, I found MASTERING THE ART OF FRENCH EATING to be a fun listen. I actually was surprised by how much I learned about France and its food, but I also enjoyed learning about Ms. Mah's personal journey. Highly recommended to fans of memoirs and foodie books! Thanks to BermudaOnion for sharing her review copy of this book. I have this on my list!! I'm so glad you enjoyed this as much as I did. I didn't love the food when I lived in France but Mah made me want to go back and give it another try. This sounds so charming! It would also make dead starving, I'm sure! I immediately thought of Julia Child's My Life in France when I started reading your review….this book sounds fantastic - can't wait to read it! This sounds great - I love foodie books and audio!